Did we all write poetry? I know I did. I read them in classes, and I workshopped them among friends. I once got to read a few at a library event (some lyrical little remixes of lines from Langston Hughes, trying to leverage some unearned insight into the soul of jazz and blues). When there wasn't a literary magazine to publish it, I founded one. Poetry was a very pure exercise in construction and expression, and even now I occasionally miss it. Despite its terrible potential for abuse by sullen teenagers, there’s something fundamental about poetry. In A Dying Art (2015), Clive James calls it "the queen of the humanities because all the humanities must be done for themselves alone, but poetry can prove that this is so." This is the praise of damnation, of course... he’s saying that poetry’s motives are vindicated by its social and economic irrelevance. Sad but fair. On this point -- the elevation of poetry among the arts -- Martin Heidegger is more convincing. In The Origin of the Work of Art, he says "Art happens as poetry," and like so many of his claims, this is built on a reading of history and language. As an infamous miner of linguistic resonance, Heidegger knew that the etymology of the word "poetry" (German "poesie") is from Greek poiesis, meaning "making" more generally. Poetry -- the word, the signifier itself -- drags around the trace of something bigger: the human drive to create. The question of "why" follows poetry around like an ill-tempered, codependent dog. In the last day, I’ve run across it in two different (very different) bits of criticism: the aforementioned Clive James essay, and the classic of literary theory, Harold Bloom’s The Anxiety of Influence. And as poiesis suggests, this question is a proxy for a broader one: why art in general? Why do we still insist on making things, when every practical and extrinsic motive is refuted? A 2016 stop-motion Samurai film -- Kubo and the Two Strings -- opens up this question ("why art?") and tries to give us the first traces of an answer. 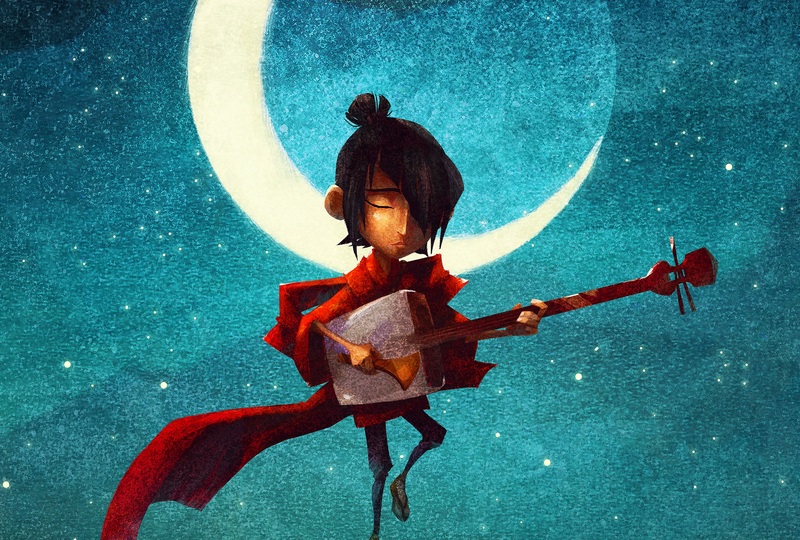 Kubo and the Two Strings is not a rumination on artistic practice. It’s a sentimental swashbuckler, the story of a boy who’s being hunted by his demonic grandfather, and who undertakes a hero’s journey to save himself and reconcile the breakup of his family. Still, the motif of creative energy is highly visible: Kubo’s prized possession is a magical Shamisen from his mother, and when he plays, he’s able to invoke spirits in origami form. I have to come out right here and declare my love for Kubo... not just the film, but the character himself, a solitary boy who’s taken on a nurturing role toward his ailing mother. He’s also, essentially, a multi-media artist, using his Shamizan and his origami puppets to stage adventure stories in a public square. And as exciting as his adventure becomes, I think that the beginning of the film, his time in his cave and hometown, have far more to offer the discerning audience... the film is truly thematically front-weighted. Martin Heidegger, afore-mentioned German philosopher who ran with the wrong crowd, had a lot to say about context, and how it inevitably defines us. This is an angle worth noting in Kubo. Heidegger used terms like "world" and "thrownness" to get at this theme, but we can skip the jargon and talk about the specifics. Kubo’s life is one of misfortune and absence, from the very beginning: he lives in a cave, living by a small fire, and he travels to a single town to perform skits and trade for his household’s everyday needs. His mother lives with him, and she’s also a storyteller, but it’s pretty clear that they don’t travel a lot, and nobody in this family is going to a specialized prep school for the arts. And this context, in turn, reveals the significance of Kubo’s music and theater. Kubo’s stories are vibrant and exotic, a succession of boss-fight vignettes that catch all Kubo’s spectators in their spell. They involve a great knight (Hanzo, who Kubo patterns after his mythical father) and a cast of monsters to be defeated... giant spiders, fire-breathing chickens... and they end with the appearance of The Moon King, an evil warlord, as Hanzo’s final adversary. Like so many artists, Kubo’s art is compromised by his economic needs. His public-square stories are products, his talent packaged and sold. For most of his life, Kubo’s "why" has been banal: to buy food for myself and my mother. After the plot’s initiating event, this changes, and Kubo finds himself traveling in search of his father’s mythical armaments, his economic concerns overruled. Still, he uses his magic, which is also his art: crossing a frozen tundra, he sees a lone bluebird, and he summons a flock of origami birds to fly alongside the loner and play with her. This is where I feel the most kinship with Kubo, and indeed, I wish I practiced such a spontaneous art. Kubo and I have this "why"... this creative impulse... because of the fissure between our inner lives and the world that situates us. We feel a richness in our imaginations, a vastness of possibilities, and when we return to the real world, we find it brittle, distracted by trivialities, rigid in scope, and inevitably lonely. This is not to say that reality is impoverished. Indeed, I’ve traveled to some amazing places, and Kubo spends half the film on a grand adventure. But we all have limits, standards, patterns, boundaries that draw us back. We are all locked into our situations. Our worlds don’t go on forever, and for some of us, at some times in our lives, they don’t even go past the city limits, or outside at night. The "why" of art -- poiesis, as Theory calls it -- is that it lets us contaminate the mundane with the magic of possibility. To the well-structured, inevitable world of experience, with its stable past and fleeting present and predictable future, we can add this trickle of our private reality. Art lets us broker a peace, or at least reach a stalemate. Art is the negotiating party of our imaginations, setting out to meet with the world... to compromise, to respond, but never to submit. Postscript: You could read more into Kubo, rich as it is in thematic nutrition. I mentioned Harold Bloom, and in a deep analysis, he might become useful again. Kubo is, after all, the product of powerful influences, and his relationship with them is a crucial part of his eventual resolution. You could also write something about the sort of bicameral relationship of Beetle/Mini-Hanzo, which becomes very puzzling as you learn more about the two characters. This is the expansive inner life of art, isn’t it? For every artifact, a thousand interpretations, an infinitude of lenses and dimensions. A good work of art is worth a thousand critical interpretations.